In a bowl mix the two together completely. Put into a container for use. 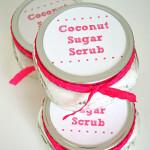 – Sugar scrubs are best for exfoliating hands and feet. – Pure coconut oil is solid at room temperature. – Unrefined coconut oil smells out-of-this world amazing!